Dry Flush, LLC has developed what we think is “The Perfect Toilet”. The unique advantage to this unit is that it does not use water or chemicals and is odor free. 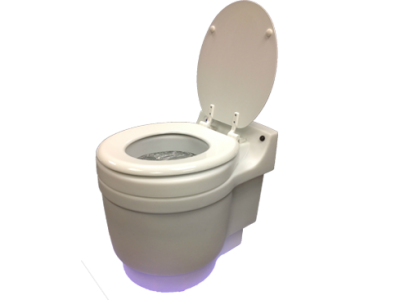 It is very lightweight, durable and is powered by a rechargeable battery cell which provides up to 300 flushes before needing recharging. It uses a specially designed cassette that dispenses clean material released into the bowl after each “flush”. The flush cycle encapsulates waste material, wraps it tightly to make an odor tight pouch and compacts it into the bottom of the inner container within the toilet. After using the unit for approximately 17 flushes, the cassette is easily removed and a new cassette can be installed in less than a minute. All waste is encapsulated in the material in a proprietary double bagging system within the cassette so the user never has contact with waste. All of the contents are then disposed of in any trash receptacle or landfill as would adult and infant disposable diapers. The Laveo™ by Dry Flush unit is perfect for RV’s, camping, boats, trucks, construction sites, cabins, tents and disaster relief areas where power outages and flooding has occurred. In addition, a model that is equipped with hand rails for medical and home care use by the handicapped, infirm, disabled or elderly is available. Read more about the features that Laveo by Dryflush™ has to offer.